Though I am a beer fan, on the lookout for new brews to consider, I got this book for the travel narrative aspect; turned out it worked well for that overall. Brown's standard procedure is to contact a country's large brewer ahead of time (such as Asahi in Japan), so that they take him under their wing. However, he does try to get beyond there to larger local beer scene. He does get a bit carried away with the historical background, but not mind-numbing so, and at times tells the reader that he's giving the highlights of the production process, as he knows being too geeky will bore many readers.The USA proved a bit problematic as he has a virulent dislike of anything related to Anheuser-Busch (Budweiser); I confess I'm not a fan of theirs either, but he takes it to quite an extreme as noted in other reviews. Still, he gets full marks for focusing on the locally-produced beer in Portland, Oregon as typical of today's American beer consumption. Really 3.5 stars, but wanted to round up as Brown seemed like a nice guy, with real curiosity about beer around the world, rather than looking for an excuse for junkets. One criticism I might make is that in Japan he came across as either a bit naïve, or perhaps a bit of a drama queen, in terms of "coping" with the culture. Only folks who really might not get into the book are ones who don't like beer much at all ("Ugh, what a boring topic! "), as it doesn't quite stand alone as a travel narrative in that case. Entertaining travelogue exploring beer and pub culture across the world. Makes me seriously want to visit Belgium and Portland, Oregon. Belgium just went from being somewhere I wasn't bothered about going to to somewhere I would like to get to this year. I was delighted by a cameo appearance from Don Delillo in this book as he is one of my favourite writers, and as it turns out also one of Pete Brown's favourite writers. Brown is introduced to him my their shared publisher and it turns out Delillo is a massive beer fan who mostly drinks Bass ale. I was also fascinated to learn that beer is really much more central to history and culture than I had realised, and it is also much bigger business than I had thought. At the time he wrote this book the value of beer sales in America alone was $75 Billion, more than film, music or mobile phones. He also fillets the Anheuser-Busch company throughout the book, exposing them as not only brewers of perhaps the worst beer in the world (Budweiser), but an appalling business run by an appalling family. The story of how they keep trying to crush Budvar makes for some enlightening reading. I'll definitely pick up a Pete Brown book if I'm in the mood for a light read. I really enjoyed this. I just wish they didn't plaster "The beer drinker's Bill Bryson" (TLS) all over his books. I almost didn't buy it because of that. I can see the comparison but I do not find Bryson funny generally and he is ventures into almost being cruel in his poking fun at times. I find Pete Brown downright funny and even if he manages to enter potential cruel territory he pulls it off with a certain British charm. May not make it any better---not claiming it does--but it is far more gentle and, dare I say it, unintended. Sorry to my friends who are Bryson fans. We'll just have to disagree about him. This reads like Bill Bryson on the lash, if that is imaginable. It is a similar style, and a concept to envy, travelling the world and visiting the world's best bars on the pretext of sampling their beer. Brown knows his stuff, but carries it lightly, and manages to make his journey interesting and amusing without becoming the pub bore that he so easily could. I especially enjoyed the chapter about America, which seems to be on the verge of doing to the beer industry what it did to the wine industry. And I defy anyone who likes a pint not to want to catch the next 'plane to Portland, Oregon after reading it.There's no place like home though, and the fact is that Britain, and Britain's pubs, are something to be proud of. Our beer is too, if only we'd admit it (and shout about it). America may well be brewing today's most exciting Indian Pale Ales, but we invented the stuff!! Therefore, by being first mover, ours is best. America can only ever be second, and who was the second man to run the 4 minute mile? Exactly. I'm not sure that Britain has to do much other than be proud of our beery heritage, and I'm sure Pete Brown would agree. In that way, this book is quite inspirational. Many countries claim to have the best beer - Germany, Belgium, Czechoslovakia, Britain - and some are just waking up to taking on the crown, but whatever the opinion we have something to raise a glass to. I'll drink to that. This one was given to me by a friend who knows that there are 2 things I enjoy in this world above most everything else - beer and books. I'd like to think I know a thing or two about beer. I try anything I can get my hands on, and I brew my own. I've read as many books about it as I've been able to get my hands on. That said, I learned a lot from this book. It's a really great overview of how beer is viewed in different cultures, as well as a lot of history and tradition from each of the countries that the author visits.Brown is an engaging writer, his tone is very conversational and the whole book was very approachable. He has a sharp wit which makes the more academic passages on history easier to bear. One caveat - though his sense of humor does make these sections go down more smoothly, there are some that remain dry and get tough to slog through. These are few and far between though, and even the driest serve some purpose.I highly recommend this one for anyone that is interested in beer, and in culture more braodly - you can learn a lot about a culture by the way it drinks, and Pete Brown does a fantastic job showing how. An enjoyable and light read, if at times a little drawn out. This author is often compared to Bill Bryson, and I'm not sure that's entirely correct. While Brown certainly IS funny, I think he wanders from the point more than Bryson does in his writing. And as for the beer, yeah, that was the best part. After the chapter on Czech beer, I had to buy a 6 pack of Pilsner Urquell, a beer I haven't had in ages. And I do think I enjoyed it more after reading the book. Brown has accomplished something kind of cool here: he's a beer fan that has written a fairly authoritative book without sounding like a alcohol-soaked frat boy. Entertaining follow-up to the author's first book about pubs, beer and 'beer culture' in the British isles. This time he travels around some of the world's major beer drinking centres - Czech Republic, Australia, USA, Belgium, Ireland, Japan, Denmark - in an attempt to note the differences and find the common ground between different drinking cultures. Wise, witty, affectionate - but never a beardy-beer snob - if you like pubs, you'll probably like this. You may also end up disliking Budweiser Anheuser Busch a lot - along with their ubiquitous, self proclaimed King of Beers, (if you didn't already avoid the ice-pissy swill). I wanted to hate him- his job was travelling around the world drinking beer. So it's to his great credit that I'd now rather go for a pint with him, happy to hide my seething jealousy.This sort of book could easily come across as pretentious or didactic, but Brown is refreshingly open-minded and drinks in eager mimicry of the locals- I doubt a card-carrying CAMRA aficionado would drink a *tsk* lager whilst melting under the midday sun on a terrace in Madrid, and that would be his loss.There's so much information embedded within stories witty regaled, really well researched.Thanks Pete. I bought this book in England. It's a book about beer and travelling - how could I pass it up? The author, previously having written a book about British beer customs, decides to travel to the world's great beer-drinking countries to check out their scene. He goes to Spain, Czech Republic, Australia, Japan, Germany and his own backyard. He's a fun travelling companion - he often drinks way too much but remains a great coversationalist. I gave his earlier book to Jay for his birthday this year - I am definitely going to put it on my own must-read list. Bought for me by Paul a couple of years ago and recently pulled off the shelf again to re-read the chapter on Oktoberfest in preparation for our upcoming pilgrimage. A really great book-- entertaining yet full of facts with interesting insights about beer culture around the world. 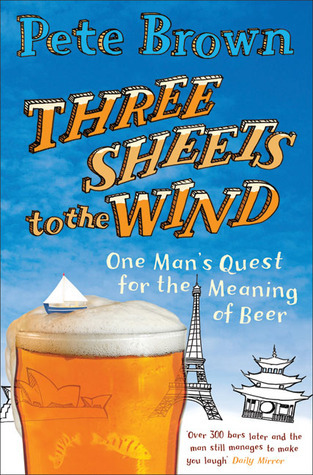 This is a book about two of my favourite things: beer and travel. Furthermore it is light and funny without diluting its own material. How can you go wrong? Pete isn't a writer and labelling him the drinker's Bill Bryson is a little lofty. However, he makes up for it with his humour and the fact that it's about beer and travel- 2 of my favourite things. It's a little padded, I think, and could have done with some editing. However, overall it was a decent enough read with enough trivia to make you the worst bore down the local. The first Pete Brown book I read. He travels the world on a quest for the meaning of beer. This book made me laugh out loud at different times and led to me also reading "Man Walks into a Pub." Eventually it led me to the Old Chicago chain to get on their "Beers of the World" group ... though I still haven't had them all. Three sheets to the Wind is much more than a single handed bar crawl. It is Pete Brown's one-man odyssey to explore the history and relationship other countries have with beer. Well researched and written, the book gives an overall impression of how beer is seen around the world, but in a tone that wouldn't be a miss with a pint in hand. A book by a British beer writer about a long pub crawl across the world (with stops in Spain, Japan, Australia, Germany, etc)? I thought I'd love it, but it was hit and miss. Some sections are great and others were a chore to slog through. Still recommended for the beer enthusiast. Really nice story of beer in the world. I heartily agree with him that the English have some catching up to do in terms of beer. If you like beer and would like to read more about the history of drinking around the world, give this a go. Mr. Brown is a funny, clever writer as well. I'm really enjoying this so far, it's making me want to go to Belgium. An amusing travelogue that covers the basics of beer lore well but has dated a bit in the last 10 years as the UK and global beer scene has improved. I doubt the author would disagree! This is fun, especially if you are at all interested in beer. Sort of alrightish. The book as distraction. It passed the time. The time would have passed anyway. I didn't enjoy this one as much as his other books, and parts of it felt dated (at least the USA chapter). Still, it was entertaining and educational. It's pretty funny, full of interesting facts and makes you wish it had been you doing the beer research. Well worth a read. I enjoyed most of this book. I feel it got bit bogged down in the middle and around100 pages to long Nearly made 4 * though. A good book to dip in & out. Shame he didn't visit France. A great tale of the various drinking cultures throughout the world! It is basically a tour of the world through drink with humorous insights. PeteBrown - There is more than one author with this namePete Brown is an English writer who has written extensively on the subject of beer and drinking cultures around the world. He has written three books; Man Walks Into a Pub, Three Sheets to the Wind, and Hops and Glory. Brown was born in Barnsley, South Yorkshire and now lives in London.Above bio is from Wikipedia. Photo is from Flickr user epicbeer.